Elevator, dishwasher (small), microwave (and grill instead of built-in oven ), washing machine, clothes dryer, hair dryer, telephone (free calls to landlines in Europe and US), wireless internet access, cable/satellite television (flat screen ), DVD, music center, CD player, walk to shops. - Clients let themselves in with a key which is provided. Rentals of 3 or 4 nights accepted. Discount for 4+ weeks. View from the kitchen into the dining and living room. View from the kitchen looking into the apartment. Hall way between the bedroom, bathroom and the main living areas. The bathroom sink which is framed by an antique cabinet. The stall shower in the bathroom. The ground floor hallway to the elevator. The famous Bon Marche and its wonderful food store around the corner. 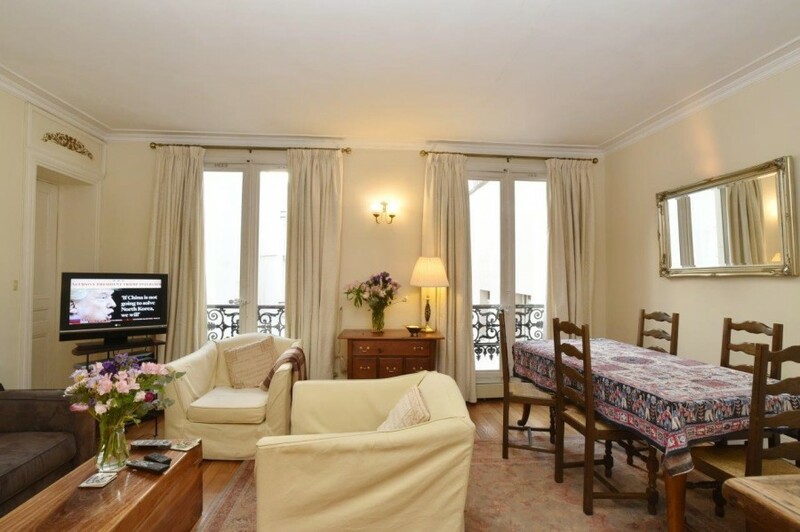 This pretty apartment is located on Rue du Cherche Midi, a very pleasant street in the popular 6th arrondissement. Within just a 2-block walk is a great selection of cafes, restaurants, a poissonerie, pharmacies, épicerie, a traiteur for premade foods and a wine store. Just 2 blocks away is the wonderful outdoor market on Blvd. Raspail which takes place 3 days a week. And the famous Poîlane bakery and Bon Marché grocery are close as well! What more could you want in a location? And as the apartment faces an internal courtyard, it is quiet, an added benefit. The apartment has wood floors, ornate chandeliers and decorative brass trim on the door handles. All nice touches. Floor-to-ceiling double French windows make it bright, and wrought-iron balustrades provide a touch of Parisian style. Several attractive wooden antiques add to the charm of a classic Parisian apartment. The entry hall is spacious and immediately opens to the pleasant main room. The living room/dining room has 2 sets of double French windows with pretty curtains. There is a rectangular wooden dining table and chairs, and a comfortable sofa and 2 armchairs. The sofa can open to a bed which is a bit smaller than a standard double. Thus it is best for one adult or 2 children. The kitchen area is to the side and is small, but well done with an antique épicerie counter adding to the charm and the work space. The kitchen has a 3-burner halogen stove top, a microwave oven/grill and a small dishwasher. It has a small window opening to another internal courtyard thus offering cross ventilation. The entry hall also leads to the bathroom and adjacent bedroom. The bedroom has a queen bed, floor to ceiling windows on the internal courtyard and ample storage space. The bathroom although small is pleasant with a tile shower stall and a sink built into an antique wooden cabinet. The washer and dryer are in this room. The toilet is separate and is by the entry door. The apartment offers a pleasant, calm and quiet environment in a prime location. 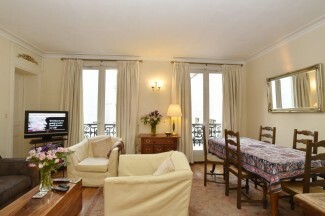 "The property was in a wonderful location and the flat was charming. Nice bedroom and living/dining room. There were plenty of supplies and kitchen tools." "Loved the location, super clean!, very charming setting, bed was VERY comfortable." "Cozy and comfortable--would love to stay there again -- and for a longer visit. Great location. Quiet and wonderful building."